Why BCBS 239 Still Matters. We asked our Kinaesis subject matter experts why those who are not swept up by the BCBS 239 regulations should be interested in implementing a data governance framework. Kinaesis are supporting DSIBs, who are currently facing oncoming deadlines from January 2018 onwards to become compliant with the regulations, as we did previously with GSIB clients. Simon Trewin, Director and Head of Architecture at Kinaesis, 23+ years of experience in the Financial Services industry, leading major change programmes to consolidate and manage and organise data to bring regulatory compliance, actionable trading insight, and financial optimisation. Barney Walker, Head of Consulting at Kinaesis, Strategic leader with over 20 years of experience in leading global divisions, delivering projects and defining strategy in technology, operations and finance. Benjamin Peterson, Senior Managing Consultant at Kinaesis, Financial Technology expert and Data Architect in the risk and trading markets. In-depth experience of data analytics and solution architecture with 22 years working with Financial Services Data initiatives. So, why should everyone else start concerning themselves with complying with the BCBS 239 Guidelines sooner, rather than later? "First, it is important to understand, the BCBS 239 regulation is not there to be difficult. It is there for protection and to encourage best practice. It allows you the chance to know and understand your data and even, by extension, the business better. Studies claim that businesses who understand and trust their data and use it for the day to day operations and decision making have brighter futures. This is no surprise: undertaking steps to comply with BCBS 239 regulations leads to a superior understanding of your data. Good governance and a common understanding of information, drives efficiencies through the reduction in reconciliation and poor decision making based on inaccurate data." "Another major consideration is the competitor aspect. With larger corporations adhering to the regulations by sorting and analysing their data, testing the limits, this gives them a significant competitive advantage over the smaller players. Ultimately, BCBS 239 is not going away. Firms that have adopted the full spirit of the principles have created a platform for a modern data-driven enterprise with significant competitive advantages over their outdated competitors." "Not making a move to comply with BCBS 239 regulations defines and limits your growth. It is worth thinking of your future and seeing compliance to BCBS 239 as an opportunity, an enabler and one not to be brushed aside." "On a final note, the better you understand your data and have a data governance framework in place then the easier it will be to implement GDPR by 2018." 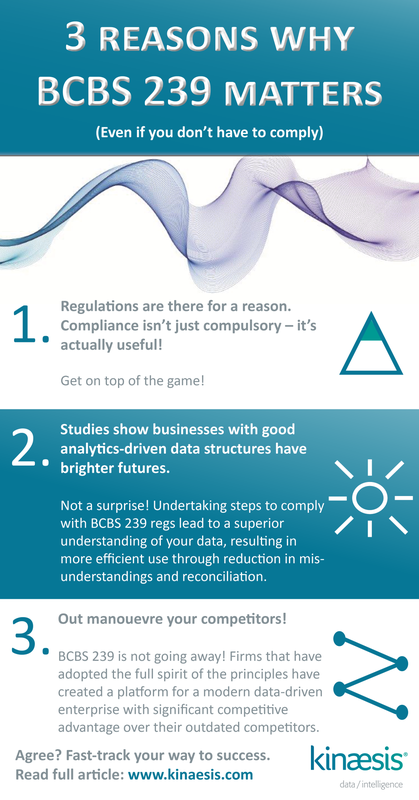 So, if you agree that BCBS 239 compliance is relevant now and beneficial to your organisation, here’s how we can help you. We offer unrivalled consultancy expertise with the data management and analytics solutions to match. If you are interested in what we offer precisely to deal with BCBS 239 challenges, click here for more information. We would be happy to present a free customised consultation as to what we do to make the process quick, focussed and above all beneficial. For more information, please contact Phil Marsden at sales@kinaesis.com.